Until I encountered the Transformation Oracle, I knew I was supposed to be extending my energies, but had no idea what that could possibly encompass. Aura Photo at my first metaphysical fair as a reader. My healing energy could finally come out! I was frightened of being “out there” in the public eye and always shied away from it before. I spent many years quietly hiding, knowing there must be some way I could serve, but not sure how. 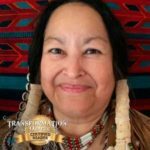 You can imagine my surprise to discover that becoming a Certified Transformation Oracle Reader was not only a very joyous endeavor, but the way to my life purpose: to extend my love and knowledge to others through reading the cards. From my very first shuffling, I was able to relate to the Transformation Oracle cards—largely due to my indigenous background and the correlation to the four basic elements: earth, air, fire and water. As a child, I was taught to respect these elements through storytelling, medicine wheels, sweat lodge, and artwork (beading and needlework.) The four elements are reflective of our beings: body, heart, mind and spirit. The artwork of this deck speaks to me every time I do a reading. After practicing in the workshops, I discovered that interpreting the cards comes easily to me. I did several readings without knowing exactly what the seeker was asking. Every aspect of the cards told me what the seeker needed to know. The Oracle hit the nail on the head every time!! My new business card (front & back) features birchbark & bear claw! When I did my first professional reading, I felt I had finally been freed from that silly fear of going public. My energies exploded! I was totally flabbergasted when I spent a whole day at a metaphysical fair doing readings for seekers and a steady stream of other readers—and came away with handfuls of $20s!! It is still exhilarating to be a professional reader. This deck, and my experiences in the certification program, helped build my self-confidence. Like I said, getting certified as a Transformation Oracle Reader is fun! My reader table with Native items based on the 4 elements earth, air, fire and water. I was compelled to launch my own business, create my own Web and Facebook pages, and even come up with a new name: Grandmother Wahseh. I ordered business cards and developed my business identity as the Anishinaabeg Elder I am—it all fits as comfortably as moccasins! 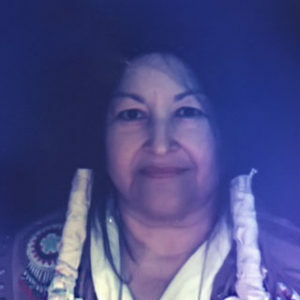 It felt natural to me to use the four elements in setting up my reader table: birch bark candles (fire and air), the birch bark canoes (water and earth) to hold my business cards, and the medicine wheel (four directions and four elements). I have signed up as a reader in several shows, going solo in the new year and proudly wearing my Native regalia. Wow! I no longer wonder what my purpose in this life should be. I feel I was reborn at this late stage. My gratitude for the Transformation Oracle is endless, and I am honored to be of service. 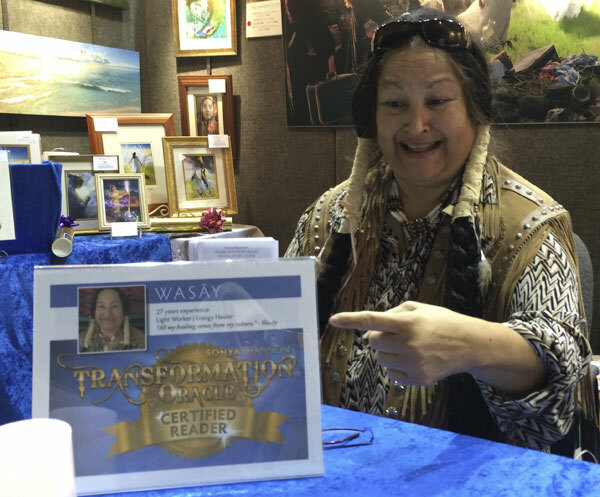 Learn how you can become a Certified Transformation Oracle Reader like Grandmother Wahseh!